Yesterday I visited the Metropolitan Museum of Art, and witnessed something that transcended the quality of the legendary masterpieces hanging in its galleries: a woman systematically and without remorse taking pictures of every single masterpiece in those hallowed halls. Using her iPad. We've been over this a million times—you look like a big idiot when you take pics in public with your tablet. Here are the only possible exceptions: You don't have your phone with you for some reason (but do have your tablet). You have important iPad-focused business to take care of immediately before or after your museum trip, so might as well use it to make sure it's working properly. You're planning a coffee table book of pictures of pictures taken on an iPad. Something tells me exactly none of those applies here. 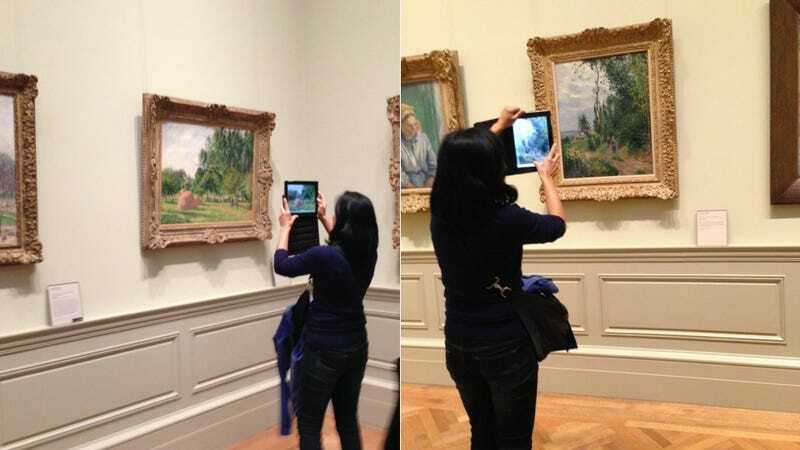 But at least the juxtaposition of priceless paintings being immortalized using a tablet is inexplicably entertaining for the rest of us!